There are places that seem simply magical. Places where history seems alive and there are signs of concern for the land. Places where work is still seen as worthwhile. Places where one can look and, for a brief moment in time, see how he came to be. There are places in which community, individual struggles, family concern, and natural beauty are all intermingled together. 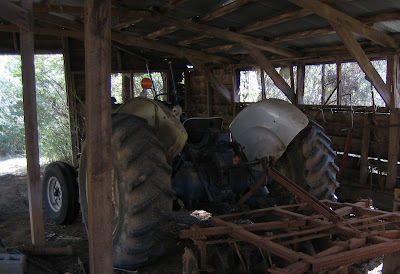 One of those places is my Grandaddy's farm in northwest Alabama. His work on this farm, and the people he has touched for miles around, stand as a testimony of his character. He's 94, and I've never been more proud to know him. ...been pondering lately how to be more like Jesus, the christian's saviour and example for transcendent living. While attempting to identify what changes to make, I look at several things. First, consider God's instruction book, the Bible. This is very helpful and remains the best single source of information overall. However, it provides principles, and application in individual lives is left to...well...individuals. One can look to other people that seem to be spiritually-minded and watch how they apply Biblical principles in their lives. Many wonderful people have been a great source of encouragement to do things that I might otherwise not realize was possible. Still, after reading the Bible and comparing it with my life and the lives of other christians, there seems to be some disturbing differences. So I was reminded of a phrase popular among professing christians not long ago, "What would Jesus do?". It was abbreviated, "WWJD". Indeed, what WOULD Jesus do? I try to imagine how Jesus would have lived and accomplished His work, if He were to have chosen our age in which to appear as a man. Would He live in the city, the suburbs, or in a rural area? Where would we find Him along the socio-economic scale? How would he dress? How would He spend His time and money? Would Jesus have a computer, cell phone, and a palm pilot? Would He carry a day-planner? Would He have a stake in our current political debates? Would He instruct us on the war in Iraq, illegal immigration, the minimum wage, and national healthcare? What political party would He identify with? What church would he attend? What group would receive the "Woe to you" condemnations the Pharisees of the first century received? What would Jesus' entertainment be like? Try this...imagine Him watching television and maybe which programming He would select...and report back to me on that. The most disturbing thing is that the vision of my example for transcendent living doesn't look like my life at all. Either my understanding of "what Jesus would do" has got serious problems or I've got serious changes to make. Anybody out there with me? I've been fortunate enough to become acquainted with an amazing new technology. It can be used for entertainment and education purposes. There are no advertisements. It includes the ability to pause, replay, and fast forward instantly. Use is practically intuitive and no instruction manual is required. When using it, it will not distract or disturb those nearby. It promotes creativity instead of suppressing it. It's portable so you can take it practically anywhere. It incorporates wireless technology. In fact, it requires no energy source to run and there is no monthly subscription. Cost varies by model, but most are less than $30. 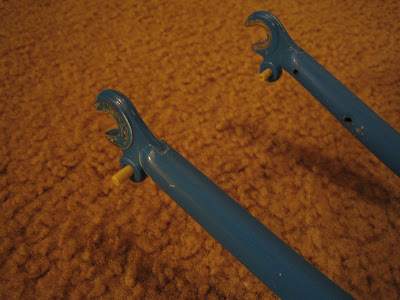 And here is one of the most amazing features of all...you are not even required to buy one to use one. I've tried this device quite a bit lately and have found it vastly superior to television and recommend it highly. Here are a few books that I've recently found encouraging. I've just started a book called, Freedom of Simplicity, Finding Harmony in a Complex World, by Richard J. Foster, and it is so good already, I'm pretty sure you'll hear more about it from me later. Yeah...what can I say, I'm quite the techno-geek. The clouds went away, the sun came out, and the temperature climbed to acceptable spray paint can range. The wind was very light and the humidity was low. It is rare to have better spray paint weather in Houston. 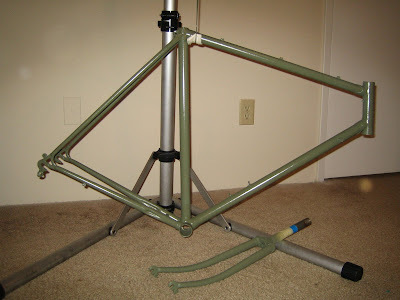 Frame and fork were sprayed with olive green primer (which is my color coat). 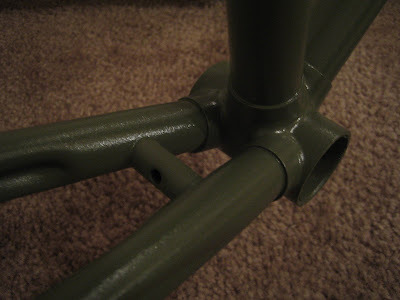 Then the frame was sprayed with a couple of coats of clear. 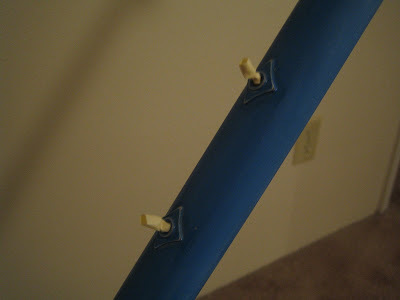 As you can see in the photo below, the fork has not been clear coated yet. It looks like the frame could use another coat of clear before it is finished, but I ran out of time yesterday afternoon. I just had enough time to get things put away, change clothes, and...yes...ride the other bike to church. I've been participating in a Bible class that is focused on the topic of Practical Christianity. The discussion has emphasized how our lives, in this materialistic, complex, overloaded, and selfish culture, seem to miss the point God has been trying to make with us. It may be that many well-intentioned believers (me included) have been missing the point. The things we spend our time and resources to pursue (career, things, power, prestige, appearance, etc.) have nothing to do with what God wants from us. At most, and to the degree they are things we need to survive, they are merely incidental. In conversations with people, it is interesting to hear the rationalizations. Sadly, they sound just like me when I talk to myself. Just like I am not quite pursuaded when talking with others, I don't think God (or anyone else) is pursuaded by me. Could it be that we are simply deceiving ourselves? What is becoming more clear each day is that God is interested in relationships. First, our relationship with Him and second, our relationship with each other. I'm afraid I'm off track. Can someone out there help me find my way back? Imagine this...a man, a bicycle frame, a bucket of water...all in a bathtub. One can learn a little about how to improvise while spending part of life in a small apartment. I miss my garage. Since the frame needed to be wet sanded and it was too dark to work outside, what are ya gonna do? It took about an hour and a half on Friday and the same on Saturday to get the sanding done. At the end of each session, there were blue-colored droplets all over the tub, my legs and feet, and my shorts. It looked as though someone had squeezed the lifeblood out of a Smurf. 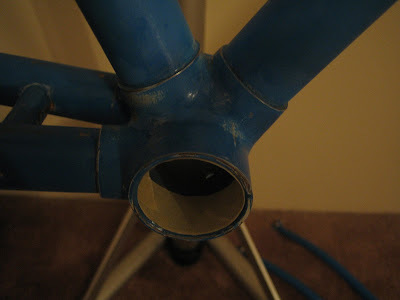 After sanding, the frame was dried and areas that needed to remain unpainted were masked. These are the last photos of this frame in this color. With luck, the weather will allow for a prime coat today. 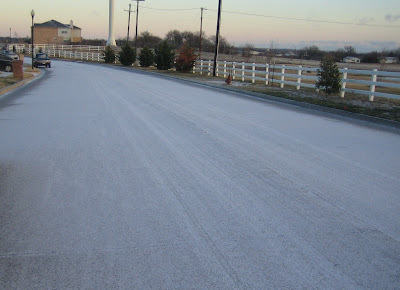 Well, I called my Houston cycling buddy about a nice coffee shop ride early this morning, but he didn't answer. He's been busy lately and probably needs to catch up on some sleep. 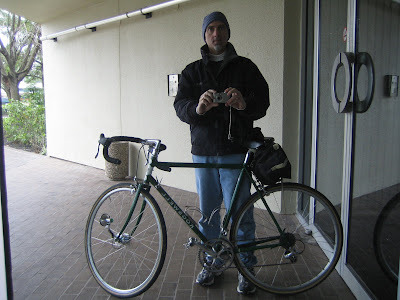 Since it wasn't raining (yet), it seemed like a good opportunity to take a short ride. 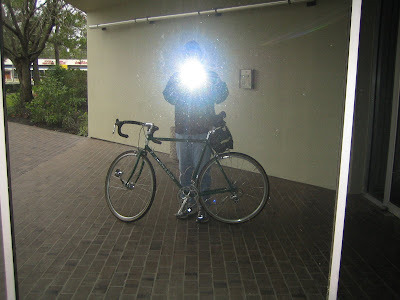 I ended up at the office to check email, get the weather, and experimented with a classic reflection "self-portrait". Meanwhile, Houston cycling buddy calls me back. He's finally up and ready for coffee. Gotta go. 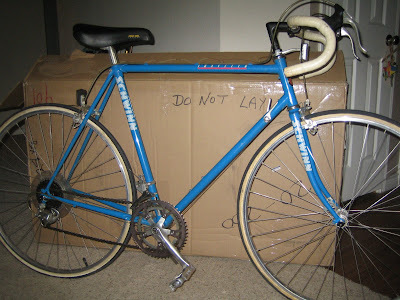 It's a busy life, but I made slight progress on project bike Schwinn. All parts were removed in preparation for...well...paint prep. 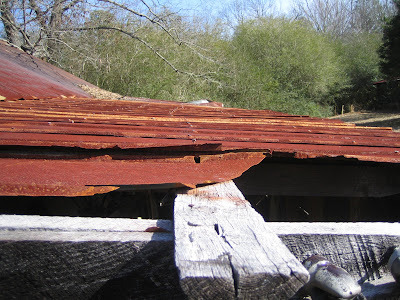 Hopefully, I'll be spending a little quality time with some sandpaper and steel this weekend. The other thing I did was drop by to see my friends at Trinity Bicycles. After several email discussions with Anthony, I spent some time in the shop with Joey discussing my dreams for this project. After putting several rim/tire combinations in the frame and taking some measurements, we put together an order for several bits I'll need to complete the build. So here is where we are...Joey orders parts, I do a cheap spray can paint job, and we get back together in a week or so to start putting some things together. What could be better? 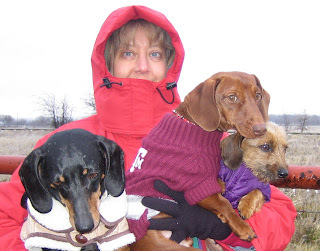 My bride, the three Dachshunds, and I took another chilly walk yesterday. We did 2+ miles in a nearby park and today I'm sore. My right hip flexor punishes me every time I move it. I will admit to not being in the best of shape, but until late last night I couldn't figure out why I was suffering so. 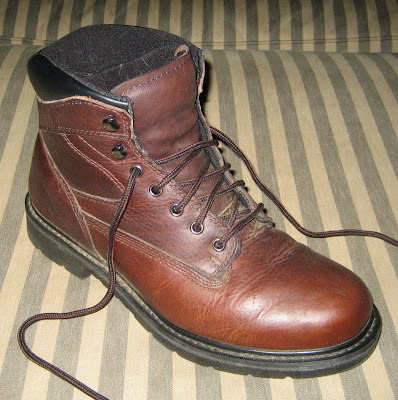 It wasn't until then that I realized that I had walked in footwear I do not normally wear. There must be a lesson in this for more serious physical challenges. It has been said numerous times, by more savvy athletes than me, that if you are planning any kind of special athletic event, be sure to thoroughly test ALL of your equipment first. 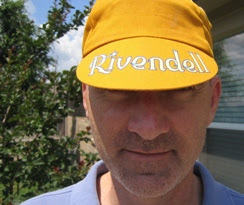 Gotta new fixed gear bike conversion candidate. 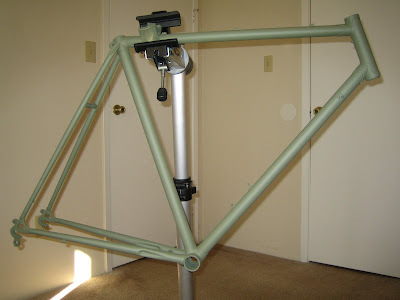 The plan is to use this frame to replace my smaller Trek 510 frame for a better fit. 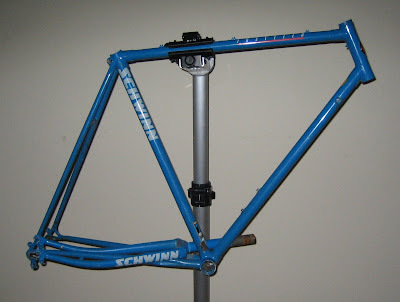 The problem is I can't decide whether this frame, which might be a step down in quality, would be disappointing after riding the Trek. I put some platform pedals on and rode it for a few minutes yesterday and was pleasantly surprised by the ride quality and I was very pleased with the fit. However, as shown above, it weighed in at 27 pounds, so I'm still debating on whether to invest time and money on this one. 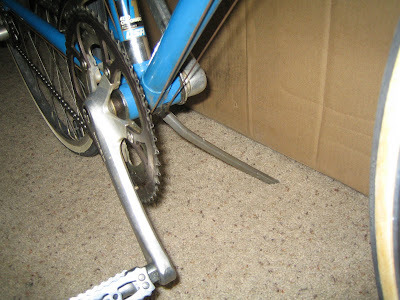 Note the photo showing the kickstand. Wow, what a concept. Like some of those other things (like lights and fenders) that my race bikes are way-too-cool for, it works pretty well. 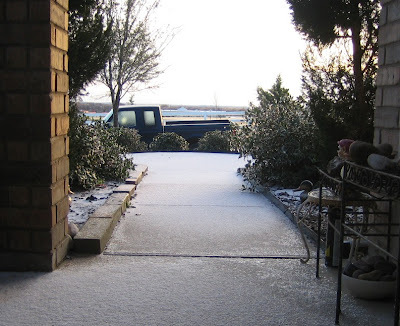 It's an icy morning out there in Justin, Texas. After rain during most of yesterday, a sleet storm last night, and temperatures in the low 20's, it looks like a better day for ice skating than driving to work. 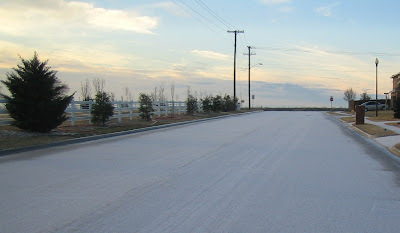 Fortunately, it's the MLK holiday and many will not be required to get on the roads. My anticipated 270-mile commute to Houston will get delayed another day at least. With the lack of cars, it looks like another great day for a bike ride (with studded tires). 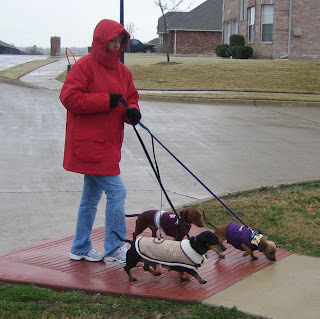 We took the Dachshunds for a short walk today. It was cold, windy, and drizzly. After a short time, they were looking forward to the comforts of home. 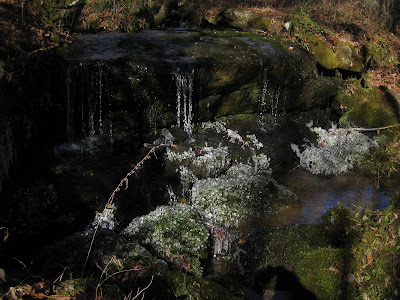 I am learning that, even in less than ideal conditions, it is worth the effort to get outdoors. But judging from their lack of eagerness, I'm not sure everyone agreed with me.